"I'm proud to announce that as a result of National Cycle's commitment to the industry and the manufacturing of quality motorcycle products, we have achieved another milestone in our 76 year history. 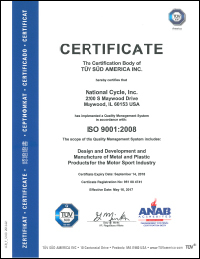 National Cycle is now ISO certified by TÜV and SUD to build accessories and parts in the PowerSports marketplace," said Barry Willey, President and CEO of National Cycle, Inc.
ISO 9000 is an international standard that verifies an organization's regulation of quality. This standard's goal is to ensure the customer that their supplier consistently provides products that will be able to meet their needs and expectations. The requirements to obtain the certification are developed and published by ISO, the International Organization for Standardization. "Our reputation as a leading provider of high quality products and outstanding customer service is further enhanced by achieving ISO certification. Our path forward is clear," Willey added. National Cycle has made motorcycle accessories since 1937 and also manufactures globally for all major motorcycle companies. "I'd like to thank all our hardworking employees as well as our valued customers for their support and trust throughout the years. Being awarded this certification further indicates our dedication to our customers and the products we build. It is our continued aim to provide products of the highest quality in all aspects including marketing and design as well as production."